Longlisted for the 2013 Women's Fiction Prize. Spotted on the library shelf last week just after the longlist was announced I took the opportunity to bring it home and read it over the weekend. 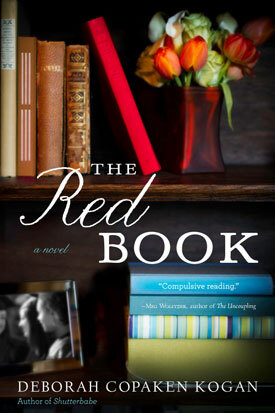 The four main characters, all women, are introduced through their entries in the Red Book, a class report published every five years by, in which Harvard alumni write brief updates about their lives. "But there's the story we tell the world, and then there's the real story"
A few months later one-time college roommates,Addison, Clover, Mia and Jane plus an assortment of husbands and children, head off to their 20th class reunion where over the next three days the warts are exposed and the dirty laundry is hung out for all to see. It's like a group mid-life crisis! How much can happen to so few in such a short time? Everything you can imagine and it's all too, too much. Midway through the book each chapter began to feel like another episode of a bad soap opera and I admit to skimming the second half . This reunion theme has been used so many times that it needs to offer something special to succeed and for me it failed to deliver. The characters and the story were so contrived and I could not relate to these over-privileged, self-absorbed women at all. It's not a bad book - easy to read, very funny at times and I liked the inclusion of the red book entries which appear throughout but overall I'm left wondering why it merits being on the longlist. Perhaps, not being American, I've missed something. Oh dear - well, I won't be looking for this one then! Only my opinion and looking at other reviews there are those who loved it . This is one on the longlist that I'd never heard about before. It doesn't sound like it really merits it's place. I'm planning to read the whole list but I might leave this one until later on! I'd never heard of it either! I'm sure there will be far more rewarding leads on the list so I'd agree - keep it until later. Hmmm, I was thinking of reading this book after it was longlisted for the Prize Formerly Known as Orange. But it's not my type of book (I'm not a big reader of women's fiction) and so if it's getting bad reviews maybe I just won't try it out. I guess I'll see what happens though!